Here’s a wonderful set of printable resources to help you teach your students about the Fall Feasts in a fun and engaging way. Includes the Day of Trumpets, Day of Atonement, Feast of Tabernacles (Sukkot), and the Last Great Day. This Activity Book can be used to fill a Bible interactive notebook or as standalone activities. Contains 97 printable pages of coloring pages, quizzes, Bible verse copywork, creative writing and drawing activities, fact sheets, crafts, recipes, puzzles, and more. The perfect resource to keep on hand for Homeschoolers, Sunday and Sabbath school teachers, and parents. Very little teacher prep needed. Just print the activity sheets and go! View the Preview for a closer look or download a FREE sample below. 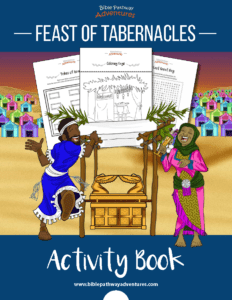 Thanks for buying our Fall Feasts Activity Book and supporting Bible Pathway Adventures. Every printable book purchased helps us continue our work providing free discipleship resources to families and missions around the world. Click the button above to download a FREE sample of our Fall Feasts Activity Book. Or click on a cover below to view more Activity Books.